Eishima Shinobu was the 4th seat of the 9th Division in the Gotei 13 and served under Captain Muguruma Kensei . Eishima is a long-haired Shinigami. He bears a strong resemblance to Jūshirō Ukitake, but with hair that is a dark red. His bangs curve more to the side while Ukitake's bangs are only slightly curved to the side. Eishima's bangs however, do not hang over his right eye like Ukitake's. 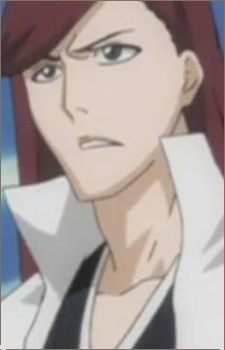 He dresses like the other former members of the 9th Division, with the standard Shinigami uniform and a white jacket that he wears over his Shinigami uniform with a collar that reaches up to his neck. Unlike the more cheerful Captain Ukitake, Eishima appears to be a more calm, quiet, and serious person. Along with the other members of the group, Eishima tries to keep his captain's anger under control by restraining him when his lieutenant irritated Muguruma Kensei. He did not seem to be as annoyed by the 9th Division's lieutenant's antics, unlike his former captain. Eishima was first introduced when Muguruma Kensei and other high ranking seated officers of the 9th Division were sent to investigate the disappearance of the Rukongai residents. He and the other 9th Division members were seen saving a young Hisagi Shuuhei and his friends from a Hollow. When Kensei told Hisagi to smile, Eishima told his captain that it was too much to expect from him. After the battle, they learned from Kuna Mashiro (who was absent during the fight) that there were missing Shinigami as well after she discovered 10 empty shihakushō near the Hollow attack site. Kensei connected the number of empty shihakushō that Kuna found with the number of members in a vanguard that was sent to investigate earlier. Realizing the seriousness of the situation, Kensei gave various orders to his men. Eishima was ordered to contact Central 46 to alert them of the first Shinigami victims in the case. Later in the night, Todō returned back from the 12th Division as Eishima and Tōsen Kaname stood guard outside. Todō offered to take over guard duty watch from Tōsen so that he could have a break, but Tōsen refused, insisting that all three of them stood guard. Eishima told Todō that they were alternating guard duty in short periods as Kasaki Heizō and Kensei were inside resting and instructed Todō to keep watch at another spot. While Lieutenant Kuna, Kensei and 3rd Seat Kasaki were resting, they heard Eishima's voice as he was attacked. Kensei and Kasaki rushed outside to find a bloody Eishima and Tōsen lying on the ground. Swordsmanship Specialist: As a 4th seat officer of the Gotei 13, he possesses skills in the use of swords during combat and knowledge of swordsmanship. His Zanpakutō had a dark blue hilt, as well as a circular bronze guard.